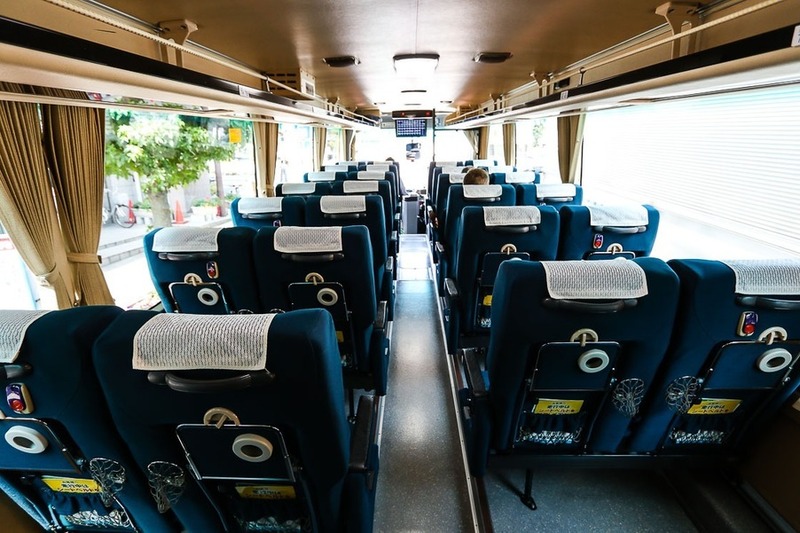 Located a short ride by bus or taxi from Narita Airport, the town of Tako, population 15,000, offers transit passengers and other visitors an escape from the monotony of the airport lounge or the hubbub of Tokyo. Similar rural scenes to those in Tako can be found in countless valleys and agricultural plains across Japan, yet most visitors from overseas miss out on this experience when they stick to the well-worn tourist destinations of Tokyo, Kyoto, and other large cities. Explore the countryside of Tako and you’ll see another side of Japan. 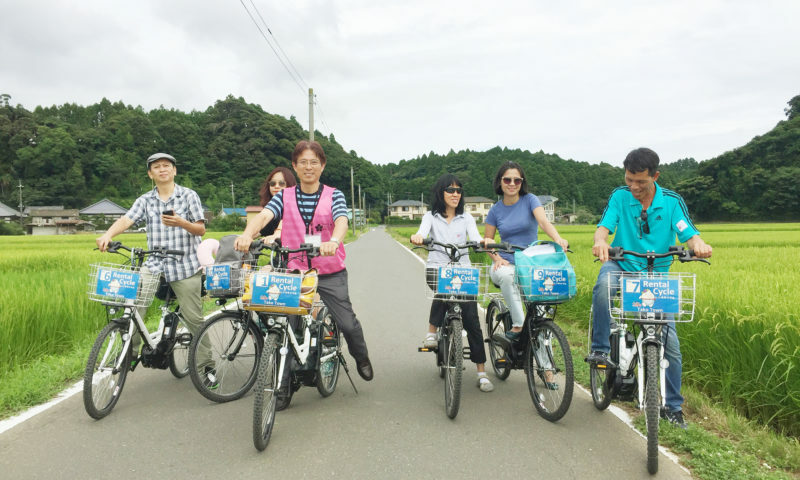 Surely there’s no better way to explore Japan’s countryside than by e-bike. Lazily pedaling along the narrow dirt roads between rice fields, cruising along the paved paths above the riverbank—where gorgeous hydrangeas bloom in June—and feeling a small thrill whenever the electric motor gives a sudden speed boost—who wouldn’t feel relaxed out here? Stop and start whenever you like, going at your own pace. 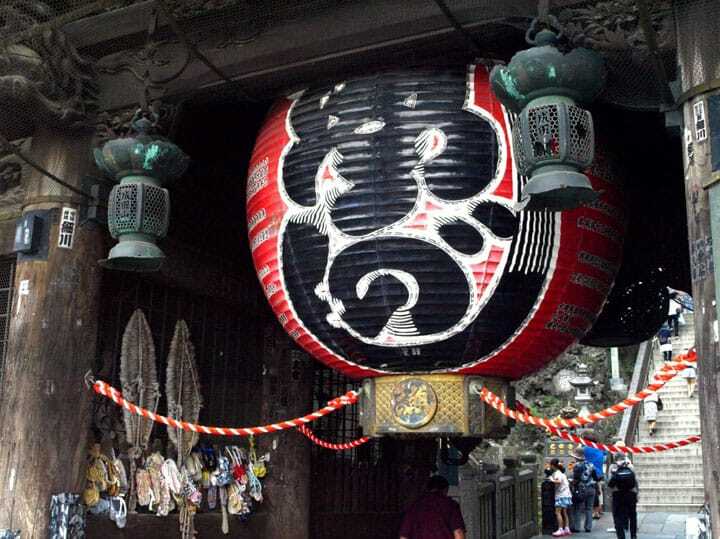 There are plenty of opportunities for social media-worthy snapshots, whether they take the form of huge koi-nobori carp streamers blowing in an April breeze, bright green rice fields in summer, or the majestic bell tower of a centuries-old temple. Electric bicycles can be rented at Tako Ajisai-kan, the “roadside station” that serves as a rest stop and central facility for visitors. The cost for rental is a mere 500 yen at time of writing, and the bicycles can be used for an unlimited time, just as long as you return them by 5pm on the day of rental. 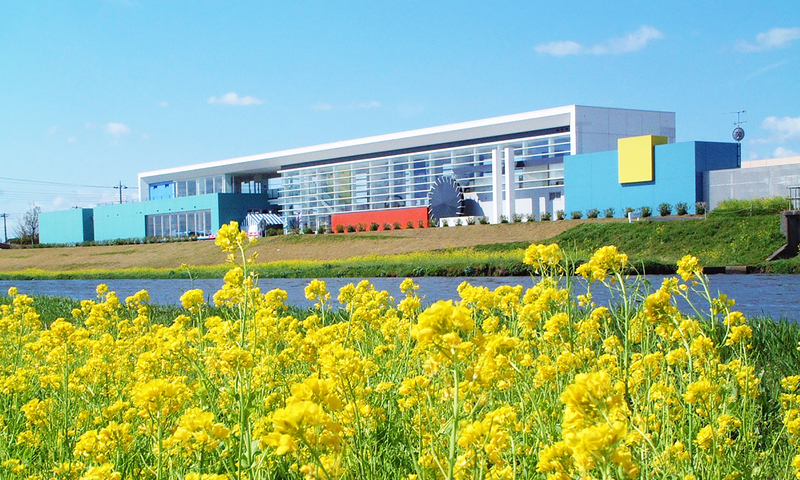 The rental location is also convenient, with buses from the airport stopping just across the street, and a store and restaurant with various lunch options. 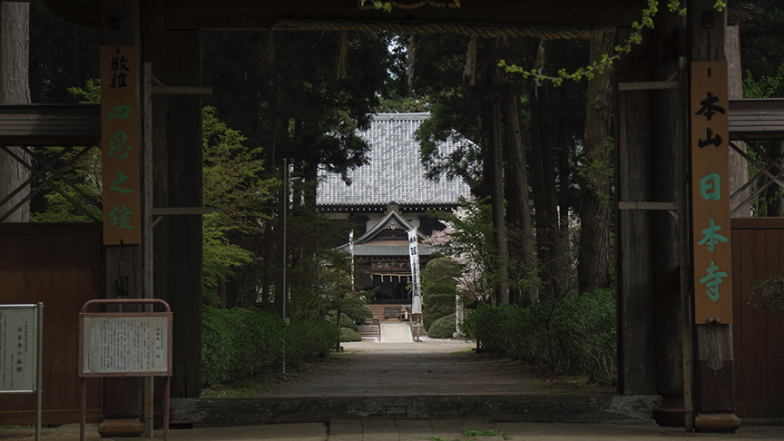 If time allows, be sure to head uphill to 700-year-old Nichihon-ji, an unassuming yet important Buddhist temple of the Nichiren school that once served as a learning center for monks. (If the mention of “uphill” sounds discouraging, remember that you’re on an e-bike! Just give the pedals a little extra push when needed and you’ll find yourself conquering the hill with minimal effort.) The path leading up to the temple buildings is lined with large Japanese cedars that provide welcome shade in the warmer months, and here among the trees grow literally thousands of hydrangea that bloom in pretty shades of blue, pink, purple and white in early summer (usually late-May to late-June). 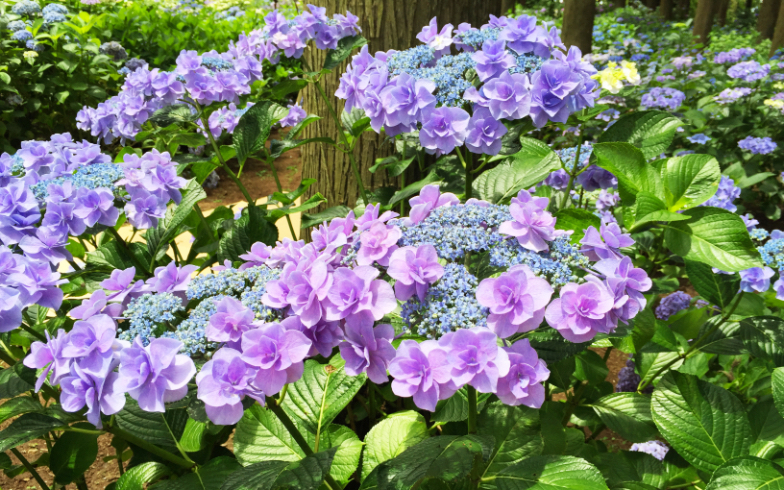 Nichihon-ji has earned the nickname “Ajisai Temple,” after the Japanese word for hydrangea. 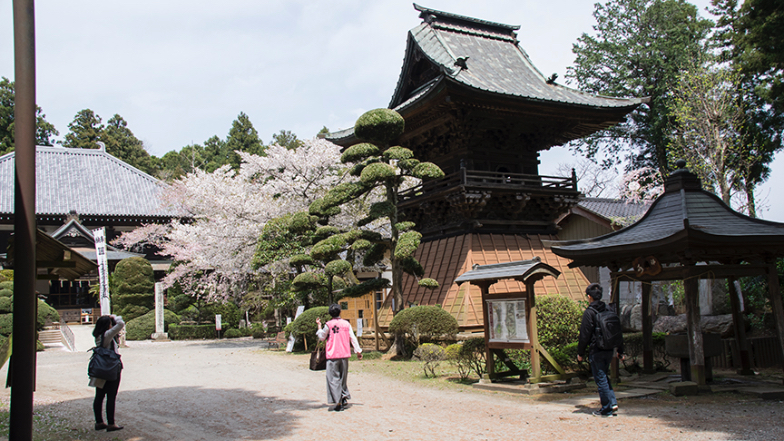 If you happen to be visiting in April, a sakura tree in the temple courtyard adds to the picturesque scenery. Even if you are not lucky enough to see the seasonal blooms, Nichihon-ji Temple is fun for another reason: they gladly give tours, showing visitors up the steep steps to the second floor and talking about the history of the temple and the daily lives of monks who came to study here. They may also give you a peak at some of the thousands of old scrolls and other documents they are in the proccess of organizing—a monumental task that is yet illustrative of this temple’s importance. All in all the tour provides a short but fascinating view into the past lives of the monks here. Although the tour is given in Japanese, if you’ve come on the Narita Airport Transit & Stay Program, your volunteer tour guide should be able to translate the essential information. After returning your e-bike at Tako Ajisai-kan, take a look in their store, the Fureai Market, and choose something for lunch or a snack. 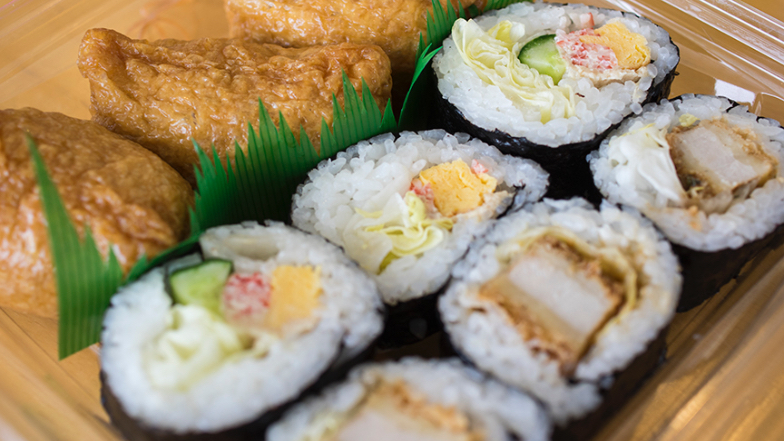 The town of Tako is most famous for its rice, which can be found in supermarkets across Japan and is apparently used in sushi restaurants internationally as well. 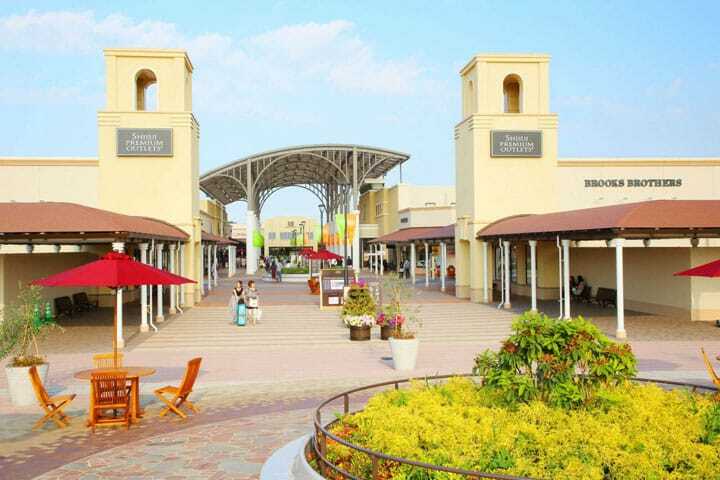 Whether the boasts of it being the best in Japan are true is something visitors will have to decide for themselves. 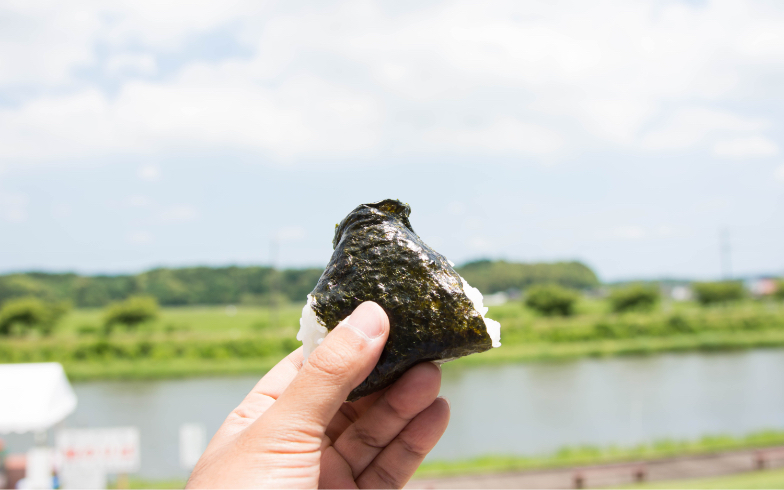 As anyone familiar with Japan will understand, one of the most popular lunch items is onigiri, or rice balls, and at the Fureai Market you can buy ones made with locally grown rice. 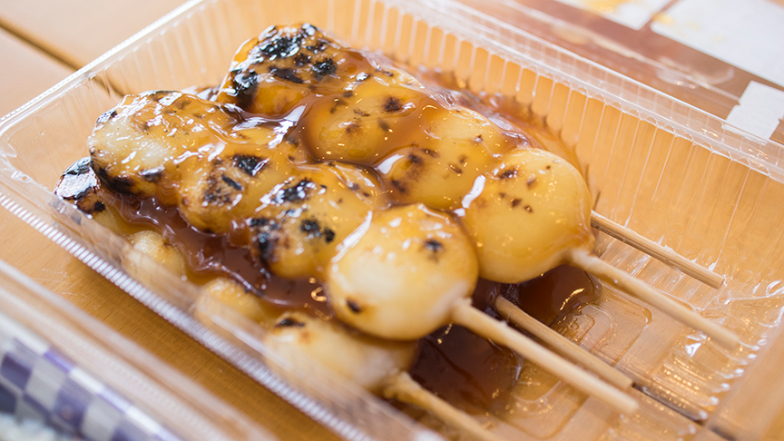 Another quintessential Japanese food that you have to try in Tako is their dango—sweet dumplings made from rice flour, on a skewer. Other items available here include Tako rice sushi and rice crackers, drinks like sake and amazake, and even Tako’s own branded soda pop! The casual dining area on the second floor of Ajisai-kan is a convenient place to enjoy your lunch indoors, or if the weather’s fine you can take your bento lunch out to the picnic tables, or even stretch out on the grassy riverbank. For visitors who’d prefer to sit down at a restaurant, Kitchen Tako serves healthy, inexpensive Japanese meals, including items such as pounded yamato-imo yam, and high-quality pork called “Genki-buta” (both specialties of Tako), as well as classic dishes like udon and soba. 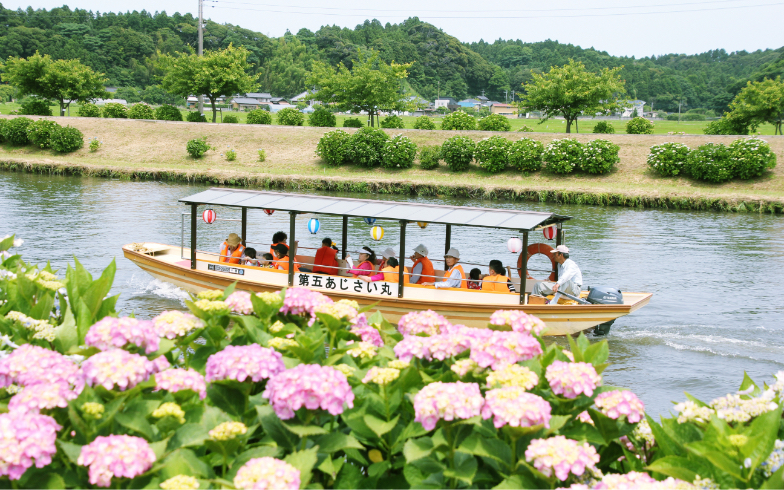 On weekends between April and August, boat tours leave from the dock below Ajisai-kan and are a lovely way to enjoy the breeze and see the hydrangea or other flowers growing on the riverbanks. Whatever Tako lacks in showy architecture or busy streets the town more than makes up with its relaxed country vibe, delicious down-to-earth food, and unassuming Japanese authenticity—a true rural gem within easy distance of Narita Airport. To book a guided tour of Tako, see Tour 3.